Danish merchant; born in Copenhagen June 22, 1816; died there Sept 19, 1884. At the age of twenty-four he entered the firm of Moses & Son G. Melchior, established by his grandfather. His father and one of his brothers, with whom he was associated in business, died a few years after, and left the management of the firm in his hands until, in 1850, he was joined by his younger brother Moses Melchior (b. Jan. 29, 1825, at Copenhagen). Together they enlarged the business greatly and founded a branch in Melbourne, Australia, in order to establish a market for Danish products. Melchior filled several important public offices in Copenhagen. He was alderman from 1851 to 1869, a member of the Maritime and Commercial Court (Sö og Handelsretten) from 1862 to 1883, and a member of the Landsthing (Upper House) from 1866 to 1874. In 1861 he was one of the founders of the free-trade society, of which he later became the director. He was one of the founders also of Privatbanken (1857), and leader of the Chamber of Commerce (Grosserersocietetet) from 1873. 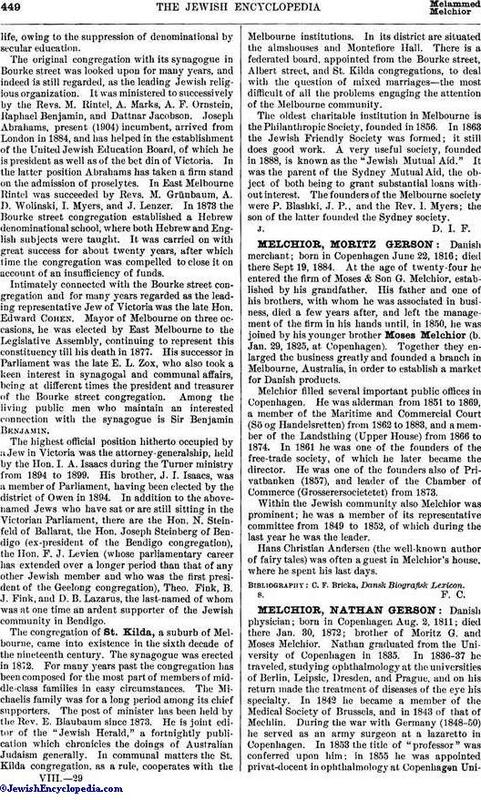 Within the Jewish community also Melchior was prominent; he was a member of its representative committee from 1849 to 1852, of which during the last year he was the leader. Hans Christian Andersen (the well-known author of fairy tales) was often a guest in Melchior's house, where he spent his last days.